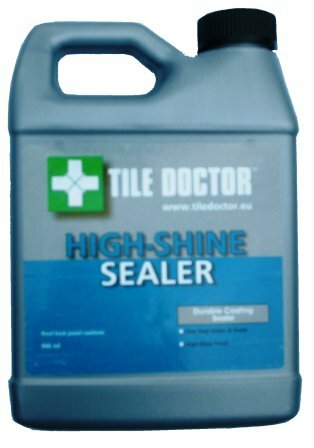 Tile Doctor High Shine Sealer is a specially formulated water-based blend of acrylic polymers that provides both a stain resistant surface seal and a durable high-sheen finish eliminating the need for two products. May also be used as a pre-grouting sealer. Is not affected by ultra-violet light. Use on Quarry Tile, Sandstone, Slate and Terracotta where a high shine is desired. Effective for interior applications only. For new installations sealer can be applied as soon as fourty eight hours after grouting. Apply using a sponge or paint pad applicator. Avoid puddling. 5.) If two or more coats are applied, allow a minimum of thirty minutes drying time between coats (most surfaces will require more than one coat). Ready for surface traffic 6 hours after final coat. Keep area dry for at least 6 hours. Achieves a full cure in twenty four hours. One litre bottle will cover approximately 8m² to 25m² (86 to 270 sq. ft.) per coat, depending on type of stone, tile, porosity and texture of surface, temperature, humidity, and method of application. Available in 1 litre bottles at £15.00 each and 5 litre bottles at £65.00 each, Postage and Packing £5.50 for a one litre bottle, £10.00 for two or more litres (All prices are shown inclusive of VAT).